Boulder County Farmers Markets: What We Eat Matters. Boulder County Farmers Markets are feeding popular demand in Boulder, Colorado. With over 30 years of market experience under their belt, BCFM has ignited a throb for grower’s only markets in their area. BCFM makes efforts to keep their markets as fresh as the vendor produce they showcase. Their Union Station market enjoyed its first season in 2016, and was a direct result of local chef conversation and craving for an urban, local food hub in Denver. Years ago they accessed market traffic and switched Boulder Wednesday to a night-time schedule and offered a beer garden. BCFM extends through a public library cafe and is preparing to introduce a new market in Lafayette. Elyse Wood, BCFM Operations and Community Manager, believes the markets stick because they act as more than just a host of fresh offerings-they are vehicles for authentic connection and multifaceted experience. Follow the BCFM markets for the next two weeks via our Instagram account! Farmers Market Coalition: Give us a little background on Boulder County Farmers Markets. Elyse Wood: We are a nonprofit organization operating producer-only farmers markets in Colorado since 1987. Our mission is to support, promote and expand local agriculture, making fresh products accessible to our community and strengthening relationships between local food producers and food consumers. We currently have four markets, with a new market (Lafayette) opening June 2017. Two in Boulder (Boulder Wednesday and Boulder Saturday), one in Longmont and our newest market in Denver at Union Station. We have approximately 160 vendors across all three markets. EW: All our markets are outdoors with exception to our annual Winter Market. 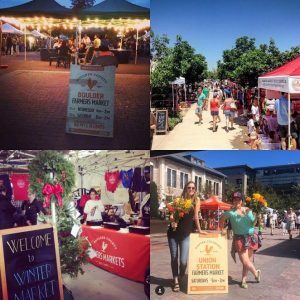 Our winter market is a one weekend event in December. It is a showcase of the last bounty of the season as well as a Colorado holiday craft fair. The Boulder and Longmont markets are suburban and the Denver market is urban. They operate seasonally April through November in Boulder and Longmont. Denver operates June through October. FMC: How do you generate neighborhood excitement for the new market? EW: We have a number of different programs and events, but each are specific to individual markets. We find that each market has their own identity and we want to foster the community needs specifically. Boulder Saturday is our busiest market so it is hardest to host activities. We host a beer garden during the week because there is a little more space to enjoy this feature. Longmont is a more family oriented market. We host four produce festivals throughout the season at this market that highlight a seasonal vegetable or fruit and then gear market-wide activities around this harvest. The Longmont market also has a permanent kids’ activity tent. In Denver, there is a large chef community. We have weekly chef demos featuring chefs from around the city. They shop the market and use only market ingredients to create their sample for the day. The demo includes cooking techniques and recipe preparation. All of our markets accept WIC/SNAP and double up to $20. We team up with local non-profits to bolster this programming. Each market has live music. We often hold photo contests to get shoppers engaged with the market. EW: We use social media – Facebook, Twitter and Instagram in addition to traditional advertising. We write a weekly column in the local paper during the season that features information on a seasonal ingredient and a recipe. We are in a local Chinook Book coupon book that offers deals throughout the year. In Denver we run ads on the Light Rail and local magazines. We also make sure to write press releases leading up to the beginning and ends of our markets. We are also out in the community doing other events at local hospitals, TEDx talks and curating our own farmer panels at local breweries. I’d say we care most about engagement and we accomplish that through social media and community events. We keep a presence in the community outside of markets. Farmers Market Coalition: How do the markets maintain being zero-waste events, in compliance with the 2005 county-wide resolution? EW: We work with a community partner Eco-cycle. They offer their services throughout the county. It’s always constant maintenance and we’re learning how to better train staff and educate consumers each year. This year we’re working more closely with Eco-cycle to provide direct training to our staff. We also are planning tours of the recycling and sorting center to offer holistic views of every piece of the process. FMC: Tell me more about the Boulder Public Library Cafe. Do any/how many market vendors contribute to it? EW: Seeds Library Cafe was born out of the idea of walking the local food walk. We encourage our prepared food vendors to source locally at the market and were coming up against push-back on this practice. We created this cafe model in order to discover and work through some of the barriers of purchasing locally for a restaurant. The cafe sources 90% locally aside from its baked goods program. At any given time the cafe is working with 5 to 10 market farmers depending on the time of year. FMC: What are the markets’ challenges and successes? EW: We are at capacity in Boulder. This is the biggest challenge because customers expect growth and more variety as the traffic increases. There is always turnover so we can add a couple new vendors each season, but growth at this point is hard to accomplish. We are involved with city development and planning to stay in tune with possible expansion. This in turn is our success. We have outgrown our location and the people want more! We’re still growing in Longmont. Sales and traffic keep increasing, but the location has the possibility for growth. Every year we see the numbers going up. The challenge here is growing the vendor pool. Most new vendors want to be in Boulder, not understanding Longmont is a contender with Boulder. This is becoming easier to do as we have had consecutive years of growth. Denver is a new beast entirely. We’ve never done an urban market so this is different to market operations. This is only resolved over time, and even with one season under our belt the operations are already more succinct. We’ve celebrated our inaugural season and we’re excited for 20 more. FMC: What is this we hear about BCFM opening a new market? EW: Yes, we are opening a new market in Lafayette, CO.The first season will run June 8th, 2017-September 28th. We are excited that the community is craving the growers only model. We are trying a new approach with our Lafayette Farmers Market. Since most of the risk in a new market is placed on farmers we are instilling a guaranteed minimum sales threshold to make sure our growers at least break even if the market takes a few years to get established. We are debuting a Founding Members program in Lafayette so community members can help distribute this risk.